The Olympus 2.0 is lighter than the previous version. Most runners noted that the traction, comfort and stability of this shoe were greatly improved. It features a gaiter trap, which effectively shields the foot from debris. Some runners were impressed by the shoe’s lugged Vibram outsole, which offered extreme durability and efficient traction. The Altra Olympus 2.0 features the Natural Ride System for a more natural foot motion. The 2nd version of the Olympus comes at an expensive price. Some runners experienced heel slippage due to the lack of additional heel support mechanisms. Others noticed that the upper unit broke off from the unit easily after a few months’ use. The Altra Olympus 2.0 is a lightweight trail running shoe that offers plenty of cushioning and exceptional grip on the trails. With this shoe, runners can keep the feet stable and relaxed even on uphill climbs and downhill plunges. This shoe is best for hiking, trail running and trail racing. Altra is famous for their natural shape with a lot of toe room. For anyone with wider feet they are definitely worth considering and have wide array of models suited for various purposes. Me being of a heavier build and mostly on trails, I have chosen to get Altra Olympus 2.0 and it has been a good choice! Fig 1. Brand new out of the box. They have that duck look due to the toebox design, but to me, it doesn't matter much. If someone wants pretty shoes, these ones will probably not be a first choice. Sole itself is very thick, but visually it appears even thicker because of rubber protruding from the soles on the sides. Now we are at the main selling point of Altra shoes. Can you imagine running on clouds? No? Go and run in Altra Olympus 2.0 and you will know how it feels like. They are so extremely comfortable that I would be happiest to wear them whole day. Damn you social conventions and business attire! Joking aside, I really have never worn more comfortable shoes. Sole is plushy, extremely plushy. I have tried few Hokas but none come close to this level of softness. Imagine Adidas Boost on steroids. Yes, it does have its' downside but looking at comfort you probably cannot get better than this. When choosing the size, if you are unable to try them in real life perhaps go half size up. They are not very long and there is not much space left between toes and front of the shoe. The width of the toe box is great. Enough room to splay the toes and feel free in them. They are perfect for my wide feet. Laces are not so good, they tend to unlash themselves even when tightened properly, so you need to double lash them or use some other method of preventing the unlashing. Or even replace them with different laces. Some parts of the sole are Vibram, other is relatively soft composition. Altogether grip is ok, it's not suited for the difficult and muddy terrain. Durability seems ok after 150km sole still looks like new. Sole is soft but I didn't have problems with rocks and roots due to the thickness of the material. Upper looks to be made of quality build, but it remains to be seen how it will look like after 500km. Fig 2. After 150km no wear and tear is noticeable. First of all, forget breaking speed records in them, it will probably not happen. When running on some usual routes I tend to be somewhat slower in them. Maybe it is due to the combination of the softness of the sole and my weight, I don't know. With my 90+ kg, they are indeed very comfortable and I did not have sore feet even after 30-35km runs, which cannot be said for all shoes. So if you need shoes for long distances then these could be an excellent good choice. Zero drop works good for me, but some people could have problems, especially if they have Achilles tendon issues. Due to the Vibram sole, they are slightly louder on hard surfaces, but comfort level remains the same. These shoes should work well for mixed trails and races involving few different types of surfaces. Problem with the shoes and only reason for lowering the grade is severe lack of the stability. They have problems on uneven surfaces, especially if the trail has side slope. They are really unstable, to the extreme. Due to the soft and thick sole, if you step on something poorly it is quite possible that your ankle will end up sprained. Worrying about each step on difficult trails diminishes the pleasure of running in those shoes. Maybe they are more stable for someone with 60-70kg. Another problem is when going on the steep downhill. Toebox and sole are relatively soft and if you did not go up with the size, you could experience issues with your toes hitting the front of the shoe. Fortunately for me, the problem is not extreme so I did not lose any toenails. Sole does look aggressive but it is misleading. Having experienced some skidding, I would definitely not choose these shoes for the difficult and muddy trails, running outside of trails, fell running and orienteering. If you plan to go with them only on moderate trails, fire roads, and similar surfaces, then these will serve you really well and you can consider the grade to be 95% because they really are excellent and superbly comfortable shoes. Not 100% only because they are somewhat slower. Due to lacking the stability I have reduced the total grade somewhat. But you probably cannot get good stability and such perfect comfort level in one shoe anyway. Olympus is definitely an unusual and interesting shoe. They really are great shoes for soft and moderate trails, also for very long runs. Comfort level is like none other shoes I have ever tried. I did not test them for a distance longer than 35km but I presume they are a good choice for ultra running. Maybe not necessarily for the whole race but definitely for the later stages when feet and legs are painful and tired. They do have zero drop, so be careful with the transition if you have never worn zero drop shoes. Also if you have problems with Achilles tendon, perhaps it is better to avoid these shoes. Due to the severe lack of the stability if you have problems with ankles, those shoes could cause you ankle injury in case of a misstep, so be extra careful or avoid them altogether. For me, Olympus are most loved shoes I own, but I feel sad they are not better suited for the difficult terrain. Fortunately, enough easier terrains do exist so I plan to run in them for a long time until they fall apart. Fig 4. Enjoying pork greaves on the top of the mountain in a remote area far from people. Who needs energy gels? The upper of the shoe has changed. It's not thinner. It's a bit lighte, more flexible. Great traction going up and downhill. The maximally cushioned Olympus is very stable and relatively light for the thickness of the midsole material under foot. The Altra Olympus 2.0 comes with an impressive high-performance outsole. It offers runners impressive grip both on dry and wet surfaces. The enhanced traction keeps runners upright even on uphill and downhill terrain without affecting the overall maximum-cushioned attributes. The Olympus 2.0 is 34 grams lighter compared to its predecessor for a faster ride. The weight reduction is due to the enhanced outsole unit of the shoe. 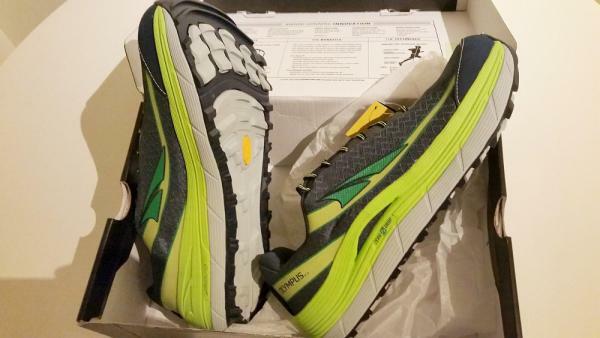 The same with the older version, the Olympus 2.0 has a standard shoe length. The forefoot and the heel areas are of wide measurements while the midfoot has a medium to high volume. Those who have tried the Altra Olympus 1.5 would experience the same fit with this version. The men’s sizes are from 7 to 15 while the women’s are from 5.5 to 12. Altra is offering the shoe under the standard widths of D for the men’s and B for the women’s. The Olympus 2.0 offers an enhanced grip on trails through the Vibram Megagrip Outsole. This outsole material is also used in the Olympus 3 running shoe. The high performance rubber compound offered unmatched grip on both wet and dry surfaces. This outsole technology is highly reliable, giving shoe longevity and maximum ground adaptability. The midsole unit features the A-Bound technology that gives runners a spring feel to each step. The environmentally friendly compound that sits underfoot offers efficient energy-return attributes and reduces ground impact while giving addition protection. The shoe’s Dual Layer EVA offers a lightweight yet durable cushioning. It helps runners experience a comfortable ride and it absorbs ground impact from every strike. The FootShape technology toe box or the natural foot design gives ultimate comfort while running. It followed the natural shape of the foot, allowing the toes to relax and spread naturally. It gives added stability especially on uphill climbs and downhill plunges. The upper of the Altra Olympus 2.0 uses a Quick Dry Trail Mesh for maximum breathability. It is generally lightweight, has an abrasion-resistant attributes and keeps debris and water from your foot. Complimenting well to the quick dry mesh is the gaiter trap that prevents debris from building up in the shoe’s upper. Its hook-and-loop tab secures gaiters to the shoe. The Olympus 2.0 comes with a removable 5mm Contour Footbed. It is made of A-Bound material and has a flat design to strengthen runners' feet.